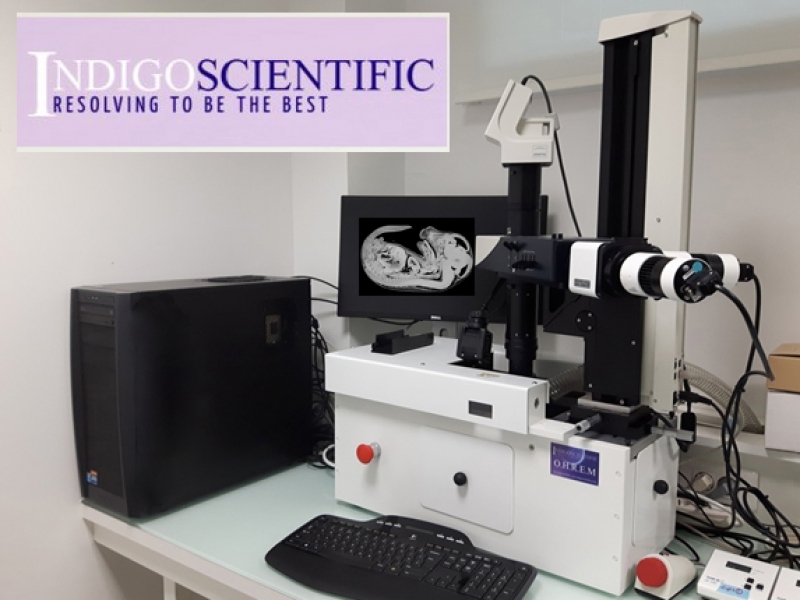 The optical High Resolution Episcopic Microscope (HREM) is a 3 dimensional image generation device for whole histological samples or embryo’s. Consisting of a motorized microtome, fluorescence stereomicroscope and camera, the HREM cuts away a sample at 1-5 micron intervals and photographs the remaining faceplate, section by section. The result is hundreds or thousands or perfectly aligned images that are available for reassembling in 3D. Maximum sample size is 25mm in diameter (although we are experimenting with a new 40mm holder). Create stunning high resolution 3D image stacks automatically in minutes, in your laboratory with the new Optical High Resolution Episcopic Microscope (HREM). This new device produces perfectly aligned serial section images for 3D reconstruction. Embryos or whole samples from 1mm to 20mm in size can be cut and captured. High resolution imaging of each cut surface thus lends itself to 3D display of the whole sample for accurate morphological view and measurement. HREM is an episcopic imaging procedure that uses plastic rather than paraffin as an embedding medium. Samples are embedded in a resin that has been made highly fluorescent by the addition of dyes. The sample block is mounted in the HREM and a section is cut from the top of the block surface. An image of the block is captured, cut after cut until the entire sample is sectioned. The result is hundreds or thousands of high contrast serial images, each perfectly aligned. Opaque and translucent tissue is imaged by its ability to suppress the fluorescence of the plastic. This results in excellent quality, high resolution images of the block surface, irrespective of the tissue type or developmental stage. A standard section thickness of 1-5 micron is achievable with no re-alignment of the sections. Sample dimensions can be from a few mm’s to approximately 20 mm maximum overall samples size. Different tissue types are easily distinguished as so little tissue is missed in acquisition. The sections are simply imported directly into whatever 2D or 3D visualization software is available. Image-Pro Premium 3D or ORS as example software packages that produce unprecedented image information. Optical High Resolution Episcopic Microscope (HREM) is suitable for use over a broad range of magnifications. HREM is perfect for DEVELOPMENTAL BIOLOGY studies. High-Resolution Episcopic Microscopy (HREM) is a technique for visualizing tissue samples, such as mouse embryos, as a large stack of successive 2D images. The resolution of the images approaches that of conventional histology and, since they are perfectly aligned, they can be used to construct very detailed 3D models. As with conventional histology, HREM imaging uses samples that have been embedded in a rigid matrix and sectioned with a microtome. However, the technique does not require sections to be individually stained or registered. Instead, each image is obtained from the exposed surface of the tissue during the sectioning process. The embedding medium is a hard plastic resin, which enables sections as thin as 1 µm to be accurately removed. The resin itself contains fluorescent dyes and, under fluorescent illumination, tissue at the cut surface of the block can be easily visualised against the bright background of the plastic. By sequentially imaging the block face during the sectioning process (a technique known as episcopic imaging), a comprehensive stack of accurately aligned images is acquired, documenting the 3D structure of the sample. The only practical constraints on the 2D image resolution are the choice of optics used to visualise the block surface and the capability of the camera capturing the images. Because HREM does not require the collection, staining and registration of individual sections, samples can be imaged rapidly. For example, a typical mouse embryo cut at 3 µm sections, is a process that will take around 8 hours and generates approximately 3,500 images. Building detailed 3D models from images of individual sections has always proved difficult, since accurate alignment of the images is required. In addition, the sections themselves often become distorted as they are cut, captured and stained. Using HREM avoids these problems by sequentially imaging the face of the block, rather than imaging individual cut sections. As a result, the resolution of the 3D data is only constrained by the choice of section thickness, since this determines the frequency of images that will provide the 3D volume. HREM images capture different tissues and structures as distinctive patterns and ‘textures’ of pixels, using a broad range of gray-scale values. 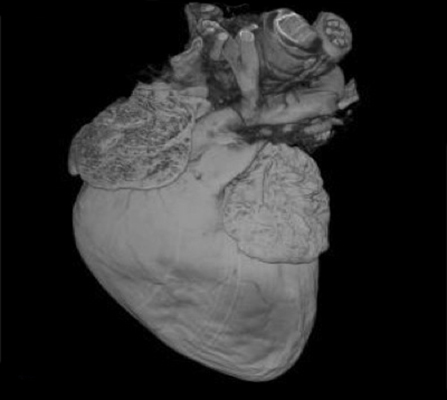 As a result, the data lends itself to simple, 3D volume rendering as is commonly used in medical imaging. It can also be used as the template for visualizing individual structures traced through successive images, modeled by isosurface rendering. 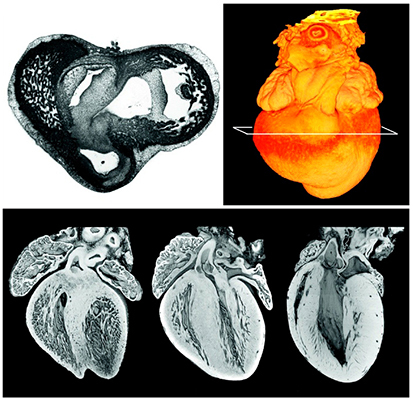 HREM data can be analyzed either as 2D image stacks or by 3D rendering. The 2D images are routinely used to identify detailed morphological phenotypes in developing mouse embryos. Thanks to the intrinsic alignment of the images, orthogonal and oblique views of the tissue sample can also be calculated from HREM data with relatively little loss of resolution. These alternative views provide valuable additional information about the morphology of a sample. Since HREM sections can be cut as thin as 1 µm, 3D models of HREM images typically have voxel resolutions of 1-8 µm3. At this resolution it is possible to identify features such as individual nerves and blood vessels, which may not be detectable using lower-resolution techniques such as optical projection tomography (OPT), micro-magnetic resonance imaging (µMRI) or micro-computed tomography (µCT). Learn what HREM can do for you! Meyer Instruments, Inc. is an authorized HREM Distributor for Indigo Scientific throughout the US. Contact us today at 281-579-0342 for more information!